DEEP IN THOUGHT . . . . Dean Shiels is hoping his dad can mastermind victory over Dinamo Minsk in Belarus. DEAN Shiels believes Derry City has nothing to lose and must be ‘fearless’ going into Thursday’s Europa League return leg against Dinamo Minsk in Belarus. The Candy Stripes trail Dinamo by two goals from last week’s first round qualifier at Brandywell Stadium and face a mammoth task to keep alive their hopes of progressing. It’s expected to be a party atmosphere in the Belarusian capital as Dinamo return to their traditional home, the reconstructed Dinamo Stadium after an absence of six years. Shiels, who made his Derry City debut in the first leg, is hoping the Brandywell outfit can dampen the celebrations and while the Maghera man hasn’t given up hopes of an upset, he knows Derry must score the first goal in the tie. “We know it will be difficult but I think our mindset is that we have absolutely nothing to lose now,” said the former Rangers and Hibs midfielder. 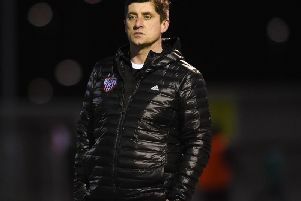 Shiels admits Derry perhaps gave their opponents too much respect in the first leg and while the visitors had dominated possession he reckons it will be a totally different game of football in Minsk. An early away goal could disrupt Dinamo’s gameplan but Shiels warned Derry must be patient and not throw bodies forward in the opening stages. “It’s 90 minutes and a lot can happen. We can’t just go and try and score in the first five minutes. We know it’s not going to be like that. We have to be patient and if we get a goal after an hour we will see what happens. But we’re not going to over commit early on. Dinamo Minsk brought just two supporters to Brandywell for last Thursday’s tie but the club expect thousands to attend their homecoming on Thursday. While it could be an intimidating atmosphere for Derry’s young players, Shiels has advised his teammates to thrive on the occasion having worked so hard to qualify for the competition last season. He’s played in the Group Stages of the Europa League during his spell with Dundalk in 2016 when the Lilywhites met Zenit St Petersburg, AZ Alkmaar and Maccabi Tel-Aviv. His experience on Thursday afternoon will be vital and he stressed the importance of keeping things tight early on. “Obviously I’ve played in big games and the more you do it the easier it becomes. But sometimes when you’re young you’re fearless so hopefully we can get the right balance of when to attack and when to defend and come away with a good result. “I think we’ll play differently. I don’t think we’ll play the same way and our tactics will be different because of the situation. We’re 2-0 down and have to score the next goal in the tie really. Shiels’ City debut was delayed due to a suspension carried over from his time with Dunfermline last season but back-to-back European ties wasn’t a bad way to announce his arrival as he joined his father, Kenny at Brandywell. He admits he still needs match fitness but agrees a morale boosting win in Belarus could ignite the club’s stuttering season. “It was a good game to start with and I enjoyed it. The players that have come in have given the squad a bit of depth and more competition and hopefully we can finish the season stronger than we did in the first half of the season. “But this is why you fight all year to get into Europe. These are the games you want to play in,” he concluded.